UHD Blu-ray discs offer an exceptional visual improvement over HD Blu-ray and look significantly better than 4K streaming. New content continues to flow out from the studios to bring the ultimate audio and video experience into the home. Never has a home video format been so articulate with colour, dynamic range, and detail while maintaining that image quality on screen sizes greater than 10 feet wide. With the Ultra-HD Blu-ray format available for about a year, we’ve seen several manufacturers step up with first and second generation products. Today I’m looking at Oppo’s first generation UDP-203 Ultra HD Blu-ray Disc Player. It supports 4K HDR10 BT.2020 discs with an upgrade path for Dolby Vision. It undoubtedly will offer you the premium home Ultra HD experience. Let’s be honest with your expectations of Ultra HD. You’re likely reading this review because you have bought an Ultra HD television or projector and you care about getting the highest picture quality to it. You may also have a sizable collection of DVDs and Blu-rays that you want to look as best as possible on your 4K display. Most importantly, you may have also read reviews of new Ultra HD Blu-ray discs that are putting Ultra HD televisions to work in a way only a disc can. Despite the popularity and convenience of mass market streaming, the image and sound quality has a long way to go before it matches what’s on disc. Big screen or small screen, the differences aren’t negligible. With the average screen size in the home growing larger every year, the need for the high quality Ultra HD source becomes ever more necessary. Sales of video disc media is still very strong. Everyone’s reasons are a bit different; it’s the permanent ownership of a disc in its case, a growing library, or a collectable box set. For myself and others it’s all of the above and the knowledge that Blu-ray – and now Ultra HD Blu-ray – definitively delivers the best picture and sound quality at home. Compared to Blu-ray, a movie on Ultra HD Blu-ray can have more fine detail, be more colourful, can have more shades in dark images, and can include very bright highlights in attempt to bring home video closer to reality. How much of each is ultimately left up to the filmmakers and/or the available film master used for the disc. Ultra HD Blu-ray’s video compression system is also far more robust than Blu-ray’s and absolutely crushes anything that streaming tries. While using Oppo’s UDP-203 Ultra HD Blu-ray player, it became very apparent to me how large the differences are – especially on bigger screens. You may be familiar to the Oppo Digital brand of Blu-ray players that have graced the pages of SECRETS in the past. These players have a track record of meeting high-quality expectations. They are solidly built and rarely seem to disappoint. I’ve had the Oppo UDP-203 Ultra HD Blu-ray player in my system for several weeks now and I’ve concluded that Oppo continues to deliver a great product. Let’s take a closer look at this player. The UDP-203 is a hefty player whose size and weight is that of what I’d expect of a higher quality component. It’s approximately 17” width will fill the full rack or shelf space and it could be used to stack other components on top of since there is no top ventilation required. In fact the Oppo’s depth is greater than some A/V receivers I’ve encountered. To prevent overheating your components, please don’t stack this player on top of the ventilation holes of a cable box, receiver, or preamp. At a weight of 10lbs with its solid metal chassis, you’d probably feel confident putting this player at the bottom of a stack, even though I wouldn’t. Components, especially optical players, deserve their own shelves isolated from vibration. The player has an attractive brushed aluminum faceplate with the disc drawer and LCD readout in the centre. There seems to be a trend lately to put buttons on the tops of components and be of feature touch design. Not so here. Oppo sticks with the classic, tried and true front panel access with seven essential push buttons. The large remote can be used for everything else, and it’s still one of my favourite player remotes. It is a bit bulky for the metro male and discerning female, but its functionality is high up on my list. The remote keys light up immediately as you touch it eliminating the need to find the light key or having a little light in the room. This a great simple but effective feature that I’m immediately sold on. The keys are large and spread apart so there will be little worry of hitting the incorrect key. It’s really easy to memorize where they’re located once you’ve used it a few times. My common go-to keys are the Top Menu, Pop-up Menu, Options, Return, Set-up, and the arrow/enter keys in the centre. Once you’ve got these down into memory, the rest is easy. The back panel is populated with essential and optional connectors. The two essential connectors are the dual HDMI outputs. Newly installed systems would only need to use the one HDMI v2.0 connector to pass UHD through a HDMI v2.0 receiver/preamp and that device would pass it to the video display. This connector will also pass audio bitstreams for DTS-HD Master Audio, Dolby TrueHD, and object-based audio DTS:X and Dolby Atmos. But many existing audio/video systems transitioning to 4K, including mine, require the use of two HDMI outputs from this player – one to the video display for UHD and the other to the receiver/preamp for lossless audio. Ultra HD video requires an end-to-end system communication of HDMI v2.0 with HCDP 2.2 copy protection to get an image. Since my Theta Casablanca IV’s HDMI card only has v1.4a, I can’t route UHD video through it to my JVC DLA-X550RB projector which does have HDMI 2.0 with HDCP 2.2. If I wanted to pass Ultra HD through my preamp, Theta offers a simple solution to upgrade the HDMI video card in my unit. But since all other A/V components don’t offer this sort of upgrade path, everyone else would require a complete replacement of a perfectly good working receiver or preamp, which isn’t practical. This is where the 2nd HDMI output comes into use; the audio from the Oppo is routed to the HDMI v1.4 receiver/preamp through this secondary HDMI connector and the video is routed from the primary HDMI v2.0 connector to the UHD display. There’s nothing to do on Oppo’s end to get this working – just connect the two HDMI cables to the right component and then press the right buttons on your audio and video devices. My preference is to get a programmed universal remote control that could do it all with the press of one button. Your local audio/video installer would be more than happy to do that for you. The rest of the inputs and outputs on this player I consider of secondary importance, but of course your personal system could dictate otherwise. Your access to external HD/UHD content could come from the internet or external drives, thus it’s essential to use the LAN connector (or wireless connection) and the USB 3.0 mass storage inputs. The Oppo UDP-203 also has an HDMI 2.0 input which is unique. If you like Oppo’s advanced 4K resolution upscaling of lower resolution sources, you can have the UDP-203 do the work before sending it to your 4K display. I’m not sure how many people are still using 7.1 analogue inputs on their receiver these days. If you are that person, you could take advantage of the gold-plated connectors for the internal DTS-HD Master Audio and Dolby TrueHD processing and AKM 32-bit premium DACs. I’d only do this if your current DACs/codec decoding in your receiver aren’t up to today’s performance and lossless standards or want to take advantage of the native DSD within the unit. I haven’t seen a system connected like this in years so my guess is that this will serve a very small percentage of knowledgeable users. The same can be said for the TOSlink and coaxial digital outputs. For everyone else, these connectors won’t be used and you’ll be using the DACs you paid for in your receiver or preamp via one of the HDMI outputs. Custom installation connectors include a very useful rear panel IR sensor, RS-232 control, and trigger in/out connectors. A three-pronged power cord is included and you can replace it with a custom one if you wish. Powering and setting up this unit was easy. The home menu is your hub for all of your digital media should you use the UDP-203 as an advanced device and more than an Ultra HD Blu-ray player. The home menu lays out all of the options from left to right at the bottom of the screen for your media playback and is viewable as icons in 2.35:1 constant image height applications such as my own. The first item is Blu-ray access with music, photos, movies, and network connectivity following. A “favourites” folder exists for commonly accessed items you’ve saved. The setup menu is also in this layout. Most settings are typically done when the player is installed, but this menu can also be brought up during playback via the setup key on the remote. This is convenient for installers and I don’t know of any other player that does this. The supplied English user manual is very detailed and includes separate commentary on various settings within the setup menu. Enthusiasts will like reading this detail and it’s refreshing to see this level of detail in the manual. Most of us know how vague other manuals are when features are rarely explained to any degree of usefulness. There’s also pride of ownership when reading a user manual that’s like a book since I feel Oppo cares as much as everything in their player I do. As firmware updates happen, the user manual will be updated online to reflect those changes. You can go to www.oppodigital.com to read through it, or to read through in fair detail with what each firmware update did. When I first put the player in my system, it was without these updates. Once I did the updates, the issues noted in the updates were resolved. I recommend ensuring your player is up to date immediately upon receiving it. All of my current UHD Blu-ray content is 2160/24p so I set the player’s resolution to UHD Auto. Most existing HDMI cables won’t have a problem with this setting, but some content is available at 2160/60p and depending on the player’s bit depth and colour space selection, the HDMI cable may require up 18GBPS bandwidth. You can manually set resolution, colour space, bit depth, and HDR options. Some purists and advanced users may like to set UHD Blu-ray discs to their native 4:2:0 and 10-bit output, although I would caution to test these options with your display device first before settling on them. A display may perform better with another option selected. For everyone else, the default Auto modes will likely be the best settings to enjoy Ultra HD Blu-ray right out of the box. Once I set my audio option to bitstream, I was ready to watch some Ultra HD Blu-ray discs. My associated gear for this review is JVC’s DLA-X550RB 4K e-shift projector I calibrated with two memories, HD-SDR BT.709 and UHD-HDR BT.2020. The image is thrown onto a 10 foot wide 2.35:1 EluneVision Reference Studio 4K NanoEdge Fixed-Frame screen. The Theta Casablanca IV with three external Theta Generation VIIIs3 DACs handles all lossless audio decoding, volume control, and digital to analogue conversion. The 5.2 audio is sent via balanced to seven Theta Enterprise monoblocks connected to Dunlavy SC-IV/a mains, HRCC-I centre, SC-III surrounds, and dual TSW-VI subwoofers. I spent several evenings watching some movies on Ultra HD Blu-ray and HD Blu-ray. I also spent a bit of time listening to some music to test the player’s functionality with other software, but it wasn’t my main focus for the review. I watched Snow White and the Huntsman, Secret Life of Pets, Mad Max: Fury Road, Ghostbusters (1984), and the first Star Trek reboot. The migration to UHD in my home has been recent so this was an exciting step. Despite calibrating dozens of UHD systems over the past year and seeing the benefits Ultra HD Blu-ray, this is the first time I’ve gotten extended personal time with the format. I’ve gained extreme respect for the format and the dramatic improvements over legacy HD Blu-ray. It is that dramatic when the formats are set up exactly as they are intended to be seen. I have the Panasonic DMP-UB900 Ultra HD Blu-ray disc player in house as well, and that player was used to draw some comparisons between the two formats. Every UHD Blu-ray disc comes with the HD Blu-ray, and in each case the HD Blu-ray at 1080p through the Panasonic set at 1080p or 2160p looked smeared by comparison, displayed reduced colours, and had flat contrast compared to the Ultra HD Blu-ray played through the Oppo. They are two different video systems at work, and Ultra HD Blu-ray is more than just an increase in resolution. While the JVC 4K e-shift projector is technically only a 1080p display, the UHD image on the disc was much cleaner and all of the additional benefits of Ultra HD Blu-ray through the Oppo UDP-203 was extremely evident. Since I was viewing these titles on a 10 foot screen, I was likely seeing Ultra HD Blu-ray’s superior video compression system at work. Blu-ray titles, by comparison, seemed to fall apart on such a large screen whereas the image of a UHD disc was completely solid. The newer titles such as Mad Max: Fury Road and Snow White and the Huntsman used a good amount of HDR that didn’t look too peaked on the projector based on how I set my image controls for UHD-HDR. The UDP-203 sent out all of the intense, bright colours and lightning bolts during the sandstorm sequence in Mad Max. The Secret Life of Pets animation UHD disc destroyed the Blu-ray edition with colour and contrast. It also delivered the pale, muted tones of Snow White and the Huntsman with deep shades of gray and crystal clear imagery. The EluneVision Reference 4K screen ensured that I saw exactly as what was projected since it doesn’t add a concerning shift in colour. Filmmakers can choose how much colour and brightness they want to use within the UHD BT.2020 ST2084 system, and right now we’re seeing UHD discs with DCI-P3 colour mastered on monitors with 1000-3000nit peaks. Can all video displays currently handle all of the information on these discs? Absolutely not, but as we quickly head into this direction, the Oppo UDP-203 can deliver this content to the display regardless of its capability. The player also supports Dolby Vision with a firmware update for discs that are about to include it. Dolby Vision has communication between compatible software, player, and display device to ensure that a good image is displayed taking into account the limitations of the video display and the Dolby Vision reference. What completely blew me away was the original 1984 Ghostbusters on Ultra HD Blu-ray. While I’ve read reviews and online comments as not being a big improvement over Blu-ray, I want to know what planet these people are on. On a properly calibrated display, there’s a significant difference with this film on these two formats. The Blu-ray’s grain looks frozen and muted compared to the active layer of film grain that looks much more delineated, coloured, and organic, even on this e-shift projector. Resolution of the image beyond the grain was an improvement and the UHD Blu-ray’s colour palette was much more satisfying. This has gotten me excited to see other older films on this format and the eventual shift to a true 4K projector. Given the choice, I wouldn’t chose any other way! Ultra HD Blu-ray definitely spoils and the Oppo does a great job at it. But I also spun a few older Blu-ray titles just to see how the player would perform. When players are optimized in the setup menu to a calibrated display, there are rarely major differences between models, and some results can vary from display to display. That’s why it’s important to get your display calibrated and have a setup disc like the Spears & Munsil HD Benchmark to make sure your player is optimized. Without these two essential steps, what’s the point of your high fidelity video quest? I tossed in the most recent Alien disc to see how it would look. No complaints here as the image looks consistent with my past experiences. It’s a good looking Blu-ray disc like so many others in my collection. But Blu-ray doesn’t always look like a reference as it should. Since it’s Easter season, I watched The Passion of the Christ with a few friends and was utterly disappointed with this transfer. I felt like I had to apologise to everyone as I didn’t remember it looking so bad. No great Ultra HD Blu-ray disc player can correct blown out and pink whites and a bad compression job. Compression artefacts show in titles like the original Star Wars trilogy and several original Star Trek movies. They were visible on my 55” OLED and they’re very visible through the Oppo on my 10 foot EluneVision. That’s one reason I’m excited to see these classics on Ultra HD Blu-ray – cleaner images mastered on better post-production monitors! I’m not a fan of using mass market video players as a CD player. They are typically slower and a pain to navigate and scan through tracks. They are also usually listened to through the HDMI connector which typically causes a fraction of the beginning of a song to cut off until the receiver/preamp locks onto the signal. I compared both the Oppo UDP-203 and the Panasonic DMP-UB900 to my reference Ayre D-1xe CD player (which happens to be a DVD player as well but has exceptional CD playback quality). As a CD player, both UHD players sounded identical to each other via HDMI and in their pure audio modes, a function that defeats some video circuitry. I have two copies of some CDs so I can do on-the-fly switching, and through my Theta-Dunlavy system, I don’t hear a thing different. Listening to Tori Amos: Under the Pink – Past the Mission revealed no difference between players. The same can’t be said for the Ayre-Oppo comparison. The Ayre, connected with an AES/EBU cable to the Theta Casablanca IV’s digital input, delivered a noticeable punch in the midrange and bass around the kick drum and more air in general around Amos’s voice and her piano. Both video players as CD players sound somewhat thinner and veiled in comparison, but not by a margin as wide as the price between the Ayre and the Oppo. The Oppo UDP-203 can send out SACD DSD natively or convert it to PCM. I’m long over this format but I understand that there are some users that are hanging onto it. I sent Nine Inch Nails: The Downward Spiral in SACD 2-channel and 5.1 to the Theta via HDMI. The mix is highly aggressive and sounded very fluid using the Oppo as a transport. Users will just need to set their preference to prioritize the 2-channel or multichannel layer and whether or not to convert to PCM like I needed to. I didn’t evaluate DVD-Audio but I do have a few Blu-ray Audio discs on hand like The Social Network soundtrack which has both 5.1 and 2.0 PCM mixes at 24/48. The Oppo did a great job at playing these through the HDMI connection as my Casablanca IV locked onto the PCM signals. I look forward to taking a closer look and evaluating the analogue outputs of the audiophile-centred Oppo UDP-205 when it becomes available. The UDP-203 can stream content from mass storage devices through the dual USB 3.0 inputs, as well as your home network. Unfortunately there are no built-in apps like Netflix, Amazon Prime, and YouTube. Since I have a projector and not a SmartTV, I need an external device that’s 4K-HDR capable for these apps. I’d like the Oppo to be the solution but it isn’t. You’ll need to connect that other device through the Oppo’s HDMI 2.0 input, receiver, or directly to your display. Streaming quality is a mixed bag, even from 4K HDR Netflix and Amazon Prime offerings. The high compression just destroys the image. I’d like to have these services within the player to reduce the number of boxes I have in my system. It’s a bit of a bummer if you use these services, but this is only one shortcoming of this otherwise excellent player. Oppo takes pride in its well-balanced disc loader and optimized laser mechanism to achieve fast disc loading and strong error detection and correction. After this point the image processing is handled by MediaTek’s quad-core OP8591, which Oppo claims is the most advanced image decoding and processing technology available for 4K UHD Blu-ray, Blu-ray, DVD, and other user media that passes through it. 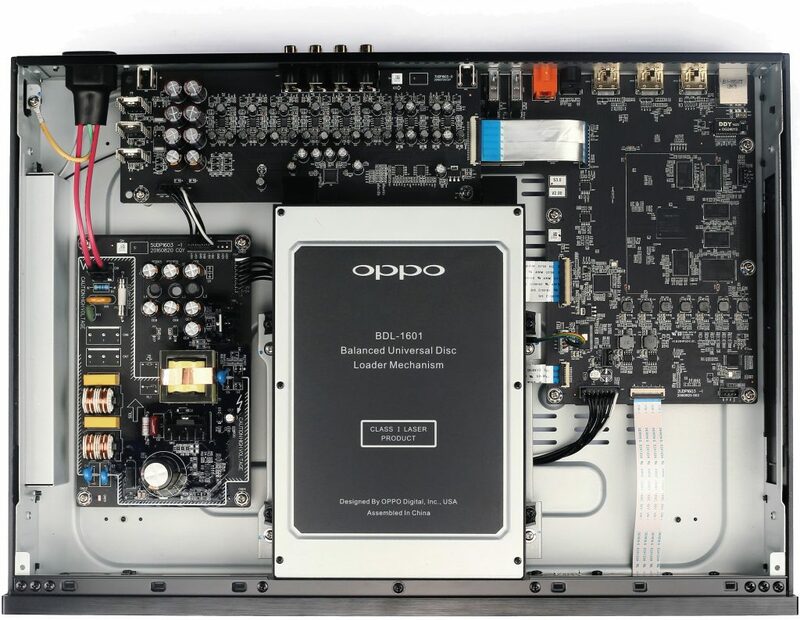 Oppo says that this is a specialized 4K UHD Blu-ray decoder SoC that no other manufacturer has matched to this point. To ensure the greatest amount of chroma resolution, the UDP-203 allows for all colour space options to find a match best for your display. Running a batch of test patterns through the player showed no drop with one of the options and my display. There are no enhancement around lines with conversion to 2160p. My Bjork: Biophilia concert Blu-ray played correctly. Many players play this back with missing frames causing the image to consistently jump. Playing back DVD showed an inconsistent and minor amount of jagged lines with Portishead: Live in New York. This player seems to play back most media without problem short of running a full gamut of tests for every possibility. THE OPPO UDP-203 is a Statement of Solid Player Construction and Functionality, and at $549, it Represents Excellent Value to Achieve Great Ultra HD Blu-ray Performance. Stepping into the UHD world is one that will be difficult to walk away from. You can’t unlearn quality images. Once you’ve seen Ultra HD Blu-ray play back correctly on a UHD display, it’s hard to not get excited about watching more films on the format. Compression is the culprit of loss for everything else. HD Blu-ray seems a little less exciting now. Compromised, illegal downloads and streams from a box of rips feels like a royal waste of time. They never hold up to the quality of a disc, even if they are labelled 1080p or 2160p. The Oppo UDP-203 is the right player for those of us who use external drives with stored media and who want to have an Ultra HD Blu-ray disc that’s just short of looking like a studio master of the film. I wish the home menu looked more like a media hub somewhat similar to what I’d expect on an AppleTV. Maybe I was looking for something busier from its otherwise simplistic layout. I’d also like to see a transport version of this unit that doesn’t include all of the audio components within it, especially since Oppo has its reference audiophile UDP-205 coming out shortly. Even though these discs are extremely impressive, like Blu-ray before it, I only expect the quality of UHD Blu-ray to surprise me moving forward. The UDP-203 can play back any disc as best as it can without any objection to the image and sound. The company supports detailed firmware updates and is highly communicative to its customers and knows who its audience is. That’s a great thing. With a mix of heft and beauty, this Oppo would be a great fit into any system.